Ten years on from the financial crisis, European economies are at last showing cautious signs of recovery, with the euro area predicted to grow by 1.9 percent this year (versus 1.8 percent in 2016) and emerging European markets by 3.5 percent (versus 3.0 percent in 2016).1 However, the pick-up in economic activity still looks fragile, and sustained momentum cannot be taken for granted. In particular, European labor markets remain under pressure, with high levels of youth unemployment and a growing polarization of demand for skills as middle-skilled employment falls in several countries.2 Investment levels are low compared with previous recovery periods, given the depth of monetary stimulus, with particular shortfalls in digital, energy, and transport infrastructure.3 The competitiveness landscape in Europe is shown in Figure 1. The challenge now is to leverage the momentum of the current recovery to strengthen the fundamental drivers of competitiveness. To this end, Box 1 summarizes recommendations from an in-depth analysis of bottlenecks to competitiveness and inclusive growth in Europe, carried out in 2017 by the World Economic Forum and the European Investment Bank, with contributions from Bruegel. This year’s GCI performance of the European region—which includes the EU28, the Balkans, Iceland, Norway, Switzerland, and Turkey—is stable overall relative to last year. 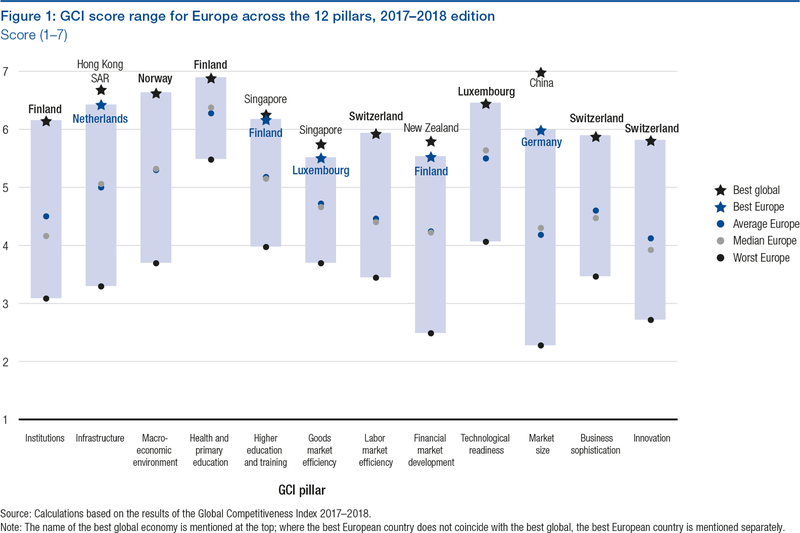 The region’s top performers remain at the competitiveness frontier, with six European countries in the top 10: Switzerland (1), the Netherlands (4), Germany (5), Sweden (7), the United Kingdom (8), and Finland (10). However, there is little sign of the region’s southeastern economies closing the gap with its northwestern ones. Iceland, Estonia, and the Czech Republic continue to occupy the middle ground between these two blocs. Taking a longer view, over the last decade many European countries have improved aspects of their innovation ecosystems, such as the quality of scientific institutions, company spending on research and development (R&D), and firms’ capacity for innovation. The last 10 years of data also show some recovery in the macroeconomic environment across the region as well as the availability of venture capital, an important ingredient for a thriving innovation ecosystem. However, over the same period the Global Competitiveness Index (GCI) shows a worrying deterioration for a number of European economies in some education indicators, such as the quality of the education system, of primary education, and of math and science education. Switzerland (1st) continues to top the overall rankings, with strong results evenly balanced across the different components of competitiveness. Economic performance benefits from extremely strong fundamentals including public health, primary education, and a comparatively solid macroeconomic environment. Its economy has a high level of flexibility, with its labor markets being ranked as the best-functioning globally. Absorptive capacity for new technologies is high, with an overall 2nd place ranking in the tech readiness of citizens and businesses. Switzerland further improves its scores for business sector sophistication and its innovation environment, thereby defending its top global ranking on those two important pillars. The Netherlands (4th) maintains its position with the support of a strong education system and high levels of tech readiness among businesses and individuals. Its thriving innovation ecosystem, ranked 6th globally, puts the country in an excellent position to shape the unfolding Fourth Industrial Revolution. Germany (5th) remains in the same position as last year, while slightly increasing its overall score. The excellent performance of its innovation and business ecosystem is particularly noteworthy: Germany’s innovation capacity and business sophistication are assessed as 5th best in the world, supported by high levels of technological readiness (8th) and high-quality infrastructure (10th). The United Kingdom (UK) (8th) falls one spot. This drop does not yet reflect the outcome of the Brexit negotiations, which is likely to further undermine the country’s competitiveness. Currently the country performs very well on technological readiness and the sophistication of its business sector (4th and 7th overall). Its macroeconomic environment remains challenging (68th) and could become an important constraint in the future as the timeline for a reduction of the fiscal deficit is repeatedly pushed back. Sweden (7th) is overtaken by Hong Kong SAR this year, dropping one spot while retaining its absolute score. The Swedish economy performs best in absolute terms on the set of basic requirements, although the data show a deterioration in the perception of the institutional environment. This is true for both public and private institutions, with the economy dropping seven spots on this set of indicators. Sweden’s macroeconomic environment (4th) continues to improve as both the government’s budget deficit and debt fell in 2016. Furthermore, the country is well positioned to contribute to and benefit from technological advances, with top 10 ranks for technological readiness, business sophistication, and innovation capacity. Finland (10th) rounds out the top 10 for the second year in a row, helped by its top global ranking for public health and primary education, and a higher education performance that is second only to Singapore’s. Finland’s approach to preparing the younger generation for the challenges of the Fourth Industrial Revolution through novel teaching approaches has been particularly noteworthy. Its high levels of investment in human capital are complemented by a sophisticated innovation environment (ranked 4th globally). Norway (11th) tops the macroeconomic environment pillar, a factor that has been a consistent weakness for most of its high-income peers in recent years. The country can further rely on strong institutions and a high-performing education system, both ranking among the top 10 in the world. With high levels of information and communication technology use and a very dynamic business sector, it is well placed to capitalize on the opportunities of the digital transformation. France (22nd) remains stable in terms of score. Its strong points are infrastructure, a large and globally integrated market, and a top-20 innovation ecosystem. Of particular concern are a weak macroeconomic environment (63rd) and historically fairly rigid labor markets (56th). In a continuation of last year’s trend, the country’s perceived capacity to attract talent falls 10 spots to 61st. Italy (43rd) improves one place in the rankings slightly increasing its score, notably through improved goods market efficiency (up seven places to 60th) and higher education and training (up two to 41st). Its long-standing competitiveness advantages include health and primary education (25th), large market size (12th), infrastructure (27th), and business sophistication (25th). Despite recent reforms, labor markets (116th) and financial markets (126th) remain weak points. Turkey (53rd) rises by two places but remains below historical highs (the country ranked 43rd in 2012). This year, it sees the strongest improvements in the take up of the latest technologies as well as in mobile broadband subscriptions—from 51 percent in 2015 to 67 percent of the population in 2016. Going forward, Turkey must improve its institutional framework, continue to remove the significant rigidities that exist in its labor markets, and strengthen the efficiency and stability of financial markets. In 2017, the Turkish economy is expected to grow by 2.9 percent. In the first half of the year, the depreciation of the lira has helped Turkish exports and the government boosted domestic demand through monetary and fiscal policies. The Europe Inclusive Growth and Competitiveness Lab (the Lab) aims to support the design, launch, and implementation of actionable agendas for public-private collaboration to increase competitiveness and inclusive growth in Europe in response to rapid technological change. The Lab was a joint initiative between the World Economic Forum and the European Investment Bank Group (EIB Group), with contributions from the economic think tank Bruegel. providing ready capital to innovative firms, tailored to their needs at different stages of the life cycle, from more venture and growth capital funding for start-ups to credit guarantee schemes for small and medium-sized enterprises—such as the InnovFin SME Guarantee Facility. The Lab calls on the community of European stakeholders to collaborate in further developing these ideas. Source: World Economic Forum and EIB, 2017. Note: Information about these programs is available at https://www.weforum.org/whitepapers/beyond-the-equity-efficiency-trade-off-practical-ideas-for-inclusive-growth-and-competitiveness-in-europe. 2 See Eurostat 2016 for data on youth unemployment; see Darvas and Wolff 2016 and OECD 2017 for details about the fall of middle-skilled employment. 3 World Economic Forum and EIB 2017; EIB 2016.